For over 100 years the "Jewel of the Grand Strand" has offered relaxation in the form of sun, sand, surf and recreation to vacationers from all over the world and that brilliant jewel is Myrtle Beach. The Myrtle Beach Hook BraceletTM captures the spirit of this beloved place in the sun, and represents the memories shared while basking in the warmth of a Carolina summer. 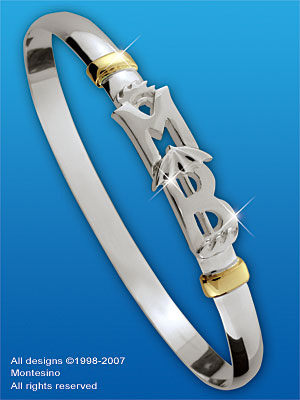 The stylized " M" holds a sunrise and hooks a "B" that is adorned with an umbrella and ocean waves; and the union of the two symbolizes the "Hook" that Myrtle Beach has on the hearts of many. The two 14 karat wraps represent the Atlantic and the ICW, between which, Myrtle Beach revels in her splendor. So join us in celebrating beach style tradition with the Myrtle Beach Hook BraceletTM... a true symbolic treasure to wear and share! !